Ohio is among the twenty-two states that have no enabling legislation for development impact fees. But in a 2000 ruling, Homebuilders Association of Dayton and the Miami Valley v. City of Beavercreek, a divided Ohio Supreme Court ruled that municipalities could lawfully enact impact fees under their police and “home rule” powers, provided that the fees could pass constitutional muster under a “dual rational nexus test.” On May 31, 2012, however, the court ruled in Drees Company v. Hamilton Township, that a development impact fee enacted by an Ohio township with “limited home rule” powers was an unconstitutional tax. The court’s unanimous opinion in Hamilton Township was authored by Justice Paul Pfeiffer, who, twelve years before, had authored the main dissenting opinion in the Beavercreek case. This Article faults the court’s opinion invalidating the impact fees in Hamilton Township, arguing that the court, rather than engaging in a fair-handed analysis, chose instead to rely on very limited authority to support a conclusion that appears to have been pre-determined. In particular, the Article demonstrates that the court failed even to acknowledge, let alone distinguish: (1) its earlier ruling upholding impact fees in Beavercreek; and (2) the state supreme court decisions that had rejected the reasoning of the Iowa and Mississippi courts upon which the court relied in part. 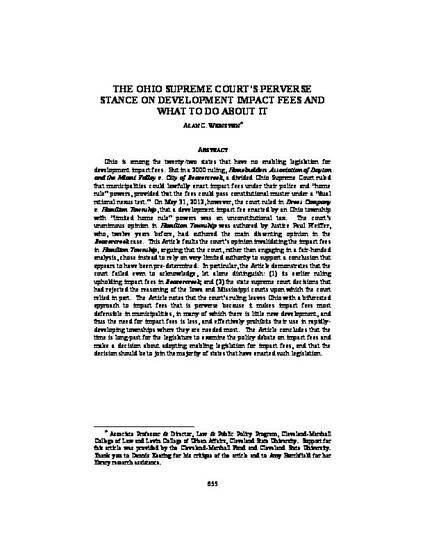 The Article notes that the court’s ruling leaves Ohio with a bifurcated approach to impact fees that is perverse because it makes impact fees most defensible in municipalities, in many of which there is little new development, and thus the need for impact fees is less, and effectively prohibits their use in rapidly developing townships where they are needed most. The Article concludes that the time is long-past for the legislature to examine the policy debate on impact fees and make a decision about adopting enabling legislation for impact fees, and that the decision should be to join the majority of states that have enacted such legislation.